3d-io is a Germany based software company. They have a good range of products including bones pro. You can buy these plugins as a pair for 200 euros here. Unwrella is a one click UV unwrap tool with a variety of other features ( including a uv packer ). While UV-Packer is just a super efficient packer. The standard uv tools in max really struggle with anything the isn’t a rectangle. So L shaped objects tend to be packed to their bounding rectangles and as a result a truck load of space is wasted. The 3d-io packer is very good at nestling shapes together and as a result very little space is wasted. Lastly while the packer is useful Unwella unwrap doesn’t offer much useful functionality over the existing max tools. Having brought the product I almost never use it . In the last few years little has changed in the feature set and I feel like development has frozen. Whilst the idea of a one click unwrap solution is attractive it simply does not work in practice and i wish I’d spent my money somewhere else. uv-packer looks like a super efficient way of pack uv shells on a texture page. Flatiron is designed for texture baking entire levels offering a 1 click solution to unwrap the whole scene into a single UV page. Polytools3d has a suite of tools including polyunwrapper and normalizer . polyunwrapper is a set of tools designed to help improve the workflow of texture Artists. 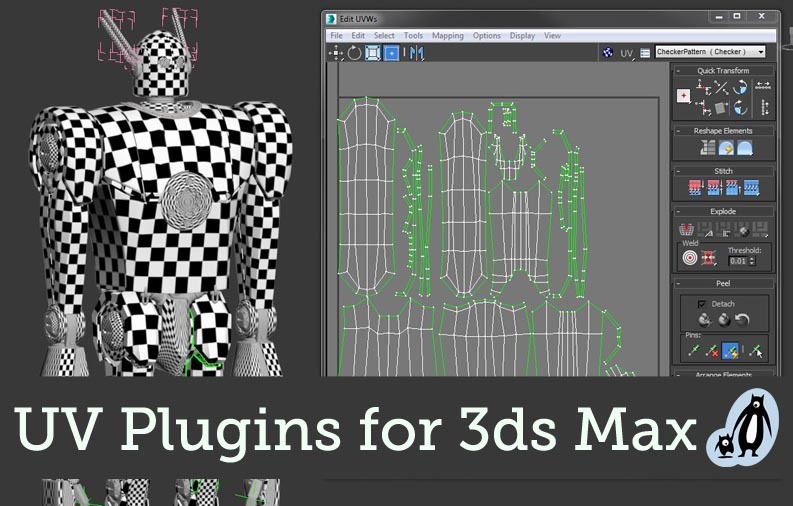 It includes most of the 3ds Max Unwrap UVW Modifier tools, as well as many additional ones. The tools are best suited for low polygon development. normalizer is a tool for normalizing the Texel Density across different objects. Raylightgames are a small company with a nice collection of useful tools. Alas they can be very very slow to update their plugins with each max release ( like 6months ) I suspect the work isn’t done until they start using the new max release in house for game dev. That said its super cheap at $40, nicely featured and available for all current versions of Max. See the xrayunwrap page for more info. At $300 for the dongled pro version uvlayout. Feels a little costly for what it does. The hobbyist version is $200 with no dongle. There is a useful 3dsmax script to help to go with the tool here. Roadkill is free software released under the GNU license. textools is a free MaxScript by the talented Hendrik-Jan Schoenmaker. It has a bunch of nice features including a 1 click roundtrip to roadkill directly from 3ds max. Looking at the video below you can see that this means a free 1 click unwrap which is pretty cool compaired to paid for versions above. It also has a projection painting feature with a one click round trip to photoshop . Neil Blevins soulburnscripts are almost legendary. There’s a host of useful tools including. Prints the area of the currently selected UV faces. Lets you flatten a selection of UVs, or in other words aligns all selected UVs horizontally or vertically. The advantage of using this tool over the one provided in the Unwrap UVW editor is you can choose to align the UVs to the average, the min or the max. Applies Flatten Mapping (also sometimes refered to as Automatic UVs), which is the same as the Flatten Mapping in the UVWUnwrap modifier, but unlike that one, can be applied to a selection of objects with each object using their own map, or all the objects sharing a single map. Good for just getting some sort of mapping on all scene objects in one button press, perhaps to then send to a paint app or to bake a texture map. Lets you modify the positions of selected uvs using a handy dialog box. Transfers uvs from one object to the next. Useful if you have two identical meshes, but their vertex order is messed up (like perhaps in the situation where you exported the object to a seperate application for uving and that application messed up the vertex order.) This script can transfer the uvs from the new object to your original object in max, even if the order is different.